In preparation for your yoga practice, find a place where you will be able to practice comfortably. You will need an uncluttered space where you will be able to stretch out and move about freely. If necessary, move any furniture or other objects that might intrude on your practice out of the way. You will be working on a smooth, flat, nonskid surface on the floor. Ideally, a bare wooden floor on which you can place a yoga "sticky mat" to help enhance balance and prevent skidding is best. 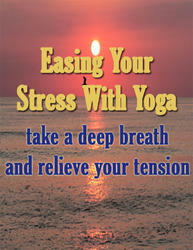 (See Chapter 17 to find out more about yoga props and how you can obtain them.) For seated postures and those performed when lying on the floor, some type of cushioning—a pillow, bolster, folded sticky mat, blanket, or towel—will help to provide support and make your practice more comfortable. You will probably find it easier to perform standing poses by standing directly on a yoga mat or a bare wood floor rather than on a carpeted surface. This will give you a firmer footing for added balance and stability. Wear loose, comfortable clothing. A T-shirt and shorts might be just the ideal attire. It is best if you are barefoot while you perform your yoga session, as this will enable your feet to have the most secure contact with the floor in standing positions. If you would like to experiment with using props, you can have accessories ready to help you. These could include a yoga belt or rope to help you in some of the stretching poses and a small wooden or foam block, or a strong and sturdy straight-backed chair or table to help support you in some of the balancing poses. You may also find it handy to have a blanket nearby to place over yourself in the final relaxation pose, as you may find that your body feels cooler when you assume the final resting pose at the end of this yoga session.